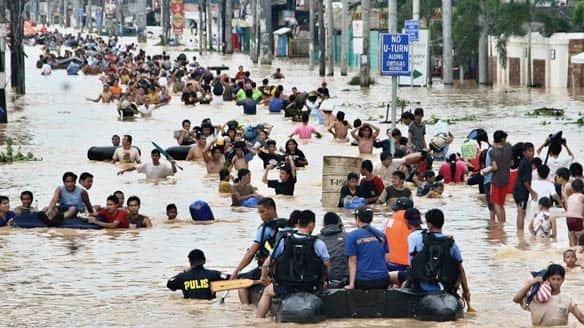 Over the weekend, residents of Metro Manila and cities in its vicinity woke up to torrential downpours and rising floodwaters brought about by typhoon “Ondoy” (international name Ketsana). This was the worst flooding the city of 12 million people has seen in about four decades, with over 80% of the area submerged underwater. 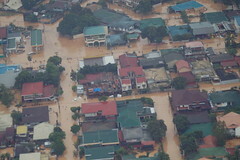 While most areas were only moderately flooded, some low-lying areas saw waters reaching past the height of two-storey houses. The typhoon is said to have brought in 400+ mm of rain–a month’s worth of rainwater in a span of 12 hours. The record-breaking rainfall levels even bested out rainwater from hurricane Katrina in the US in 2005. The disaster spared no one–both rich, poor and middle class families saw their homes and properties destroyed by the flood and landslides. What’s worse is that a lot have died, and many are still lost. As per recent news, more than 250 have died. Scores more are missing. These are especially prevalent in cities of Pasig, Marikina, and Cainta (in Rizal province). A good number of our team, staff and partners at Splashpress Media are residents of Metro Manila. So far, all of us were relatively unscathed after this terrible incident. Thus we feel responsible for extending aid to those who were badly affected. Some of our friends and family members (and even team members) have gone out and donated money, food, clothing, and physically helped in the relief efforts. But much has to be done, including a longer period of rehabilitation. News of incoming weather disturbances is making things more worrisome. Splashpress Media is running a donation drive in aid of the victims of the flooding in Metro Manila. We are starting the donation drive with $1,000 from ourselves. For those who can make credit card payments, you may directly send donations to the Philippine National Red Cross which is one of the bigger organizations organizing and handling aid. However, for those who might prefer PayPal, The Philippine National Red Cross can also accept PayPal payments through this address: [email protected]. You can copy and paste the code below, so you can add a link to our donation page on your blog, website, or social networking profile. Any help or form of support will be appreciated!